Vitamin B12 is a member of the B Complex, a group of vitamins, each with a unique function in the body, but synergistically regarded for how they help the body’s cells produce energy. 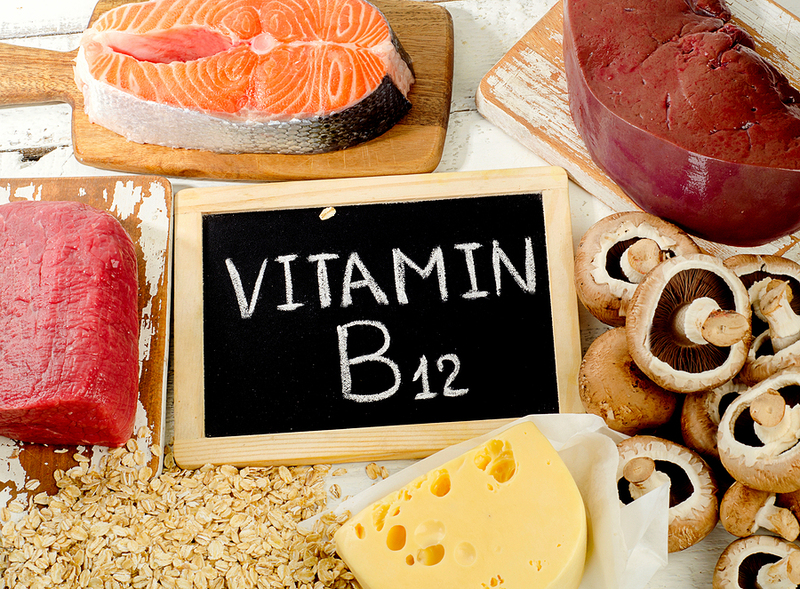 Vitamin B12, along with thiamin (B1), niacin (B3), riboflavin (B2), pantothenic acid (B5), pyridoxine (B6), biotin, and folate make up the B Complex. B12 is essential to the production of new DNA, red blood cells, proteins, hormones and fats, as well as regulating mood and maintaining healthy nervous and immune systems. If you aren’t getting enough B12 through diet, or your body isn’t absorbing or using it efficiently, you can become deficient. This can lead to a range of health problems: intense fatigue, loss of appetite, trouble concentrating, anemia, and depression. B12 deficiency affects up to 15% of people in the U.S. The aging process, a vegan diet, stress, certain medications, and illness can alter your body’s ability to utilize B12 from food. Medications, such as those for reflux or Type 2 diabetes, affect B12 absorption. Also, if you’ve had major surgery, have digestive problems, or Celiac Disease you have an increased risk for B12 deficiency. Most people who eat meat, fish, eggs and dairy products get enough B12. Vegans are advised to eat fortified food and take supplements because B12 is not found in sufficient amounts in plant foods. Carefully read labels for fortified food claims, as these foods can be loaded with preservatives that don’t contribute to your health. a tablet that dissolves under the tongue (sublingual). Taking a B12 supplement when you don’t have a deficiency doesn’t provide any health benefit. A holistic health practitioner can determine a B12 deficiency by blood test and then work with you to determine the best form of supplement for your health needs. This entry was posted in Articles and tagged b complex, b vitamin, b12, cyanocobalamin, energy, healing, Natural Treatment, nutrition, vegan, vitamins.